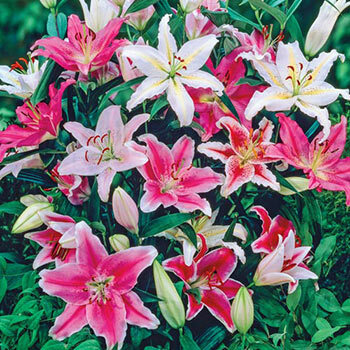 The shorter border lilies are perfect for planting in containers, along a walkway or in the front of flower beds. This delightful mix of reds, pinks and whites offers mid to late summer color and fragrance—and attracts butterflies and pollinators. Our Oriental Border Lilies also are prized for cut flower arrangements and bouquets. These easy-to-grow lilies grow just 12-24" tall and grow best in sun to partial shade. They can be planted in small groups—or for a big impact, group many of them together. 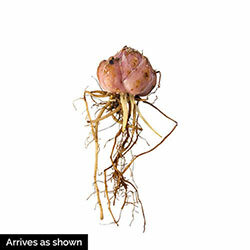 Leave the hardy bulbs in the ground year-round for increased beauty in following years. Foliage Type: Attractive, lush, dense foliage the entire growing season. Flower Form: Fully upright, cup shaped flowers with overlapping petals. Planting Instructions: In the garden, 5-6" deep and 9-12" apart. In pots and containers 5-6" deep and 5" apart. Soil Requirements: Loose, well drained soil. Pruning: Important to let the foliage die down naturally in fall. This helps provide nutrients for next season's bloom.